The road began to snake its way into the Guama Mountains and as the first sharp bend to the right approached, the car in front ground to a complete standstill, leaving us scrabbling to get into first gear before we stalled. Baffled by the need for the sudden halt as there was no other traffic on the road, we held our breath as the hire car rolled back to within uncomfortable distance of our bumper before the driver finally found the bite and resumed his excruciating journey, stuttering around hairpin bends as if he expected to drive off the cliff at any second and hitting a top speed of 2 kilometres per hour on the straight sections. Behind him, we barely got out of first gear until mercifully, he pulled off at the first viewpoint. So dangerous and yet so safe. 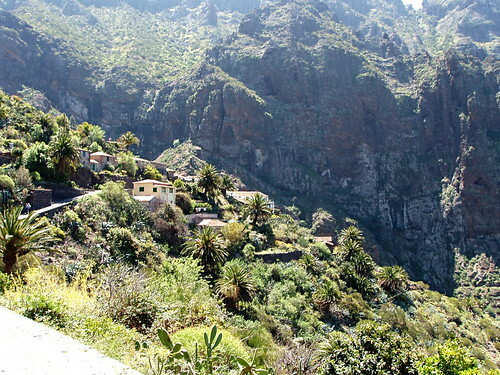 Tenerife’s second most popular day trip destination it may be, but the vast majority of visitors who make it to the remote hamlet of Masca, do so by letting someone else do the driving. 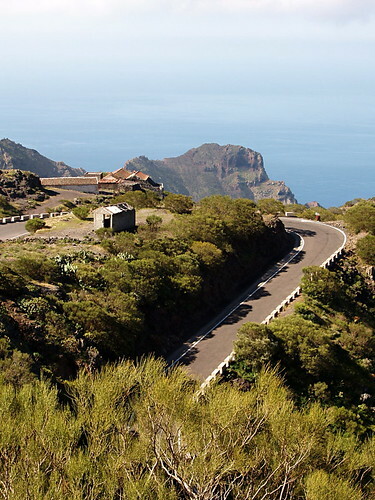 For those intrepid independents who hire a car on Tenerife and take the wheel themselves, the road to Masca is the island’s most notorious white knuckle drive, twisting and turning its way down the sheer side of a mountain in a series of gravity-defying switch backs. Ironically, the road to Masca is actually one of the safest roads on Tenerife where accidents are a rarity, and that’s because everyone is driving so slowly that even if they make contact, there’s usually no more than a smudge on the bumper to show for it. But that’s not to say a plunge over the edge is beyond the realms of possibility, particularly given how badly some visitors drive this stretch of road. In much of Europe, peoples’ daily commutes consist of road journeys that require very little in the way of steering wheel manipulation. From motorway lane changes to main road junctions, it’s a simple fact that many of us predominantly drive in straight lines. 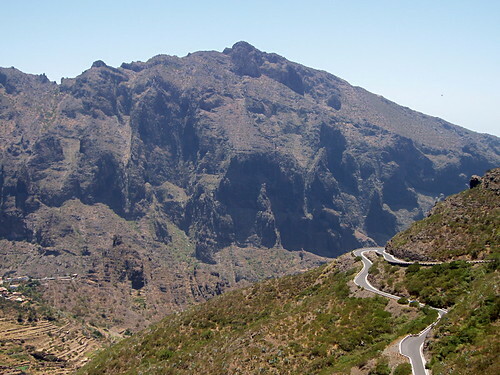 So, confronted with some of Tenerife’s narrow roads that zigzag their way up and down mountains, coupled with an unfamiliar car, your average driver has no notion of how to steer through the curves. Having spent some time in the south west of the island yesterday, we had to detour to Buenavista del Norte on the way home to check out some details about one of our Island Walks and the quickest way to do that was via Masca. Unfortunately, we found ourselves behind this very nervous hire car driver. But he wasn’t the only dangerous element on the road yesterday, the way was littered with offending motorists. Don’t use passing bays as car parks – you’re putting other drivers at risk. All the way down the road we saw stopping places used as parking spots with people posing for photos and even eating their sandwiches while their cars occupied the only space where two vehicles could pass. Follow the road markings which take you wide on left hand bends and hug the cliff on right hand bends, leaving space for oncoming vehicles to get past. The man we were stuck behind took every corner in the middle of the road, forcing oncoming traffic into the ditch or dangerously close to the edge. If a viewpoint is full, you can’t stop there. We saw two cars yesterday with their rear ends stuck half way across the road because they’d squeezed into spaces too small for their vehicles. Don’t arrive at 1pm and expect to get a parking spot. Masca is extremely popular, particularly between the hours of 11am and 3pm when the jeep safaris descend. It’s impossible to get a parking space anywhere nearer than El Palmar, and deciding to sit in your car in the middle of the little roundabout on the off chance that someone might be leaving soon is just plain silly – stop it. Having said all of that, if you’re a confident driver, the road to Masca is a brilliant drive, provided you’re not unlucky enough to be behind the bloke in the hire car who, for all I know, may still be en route. 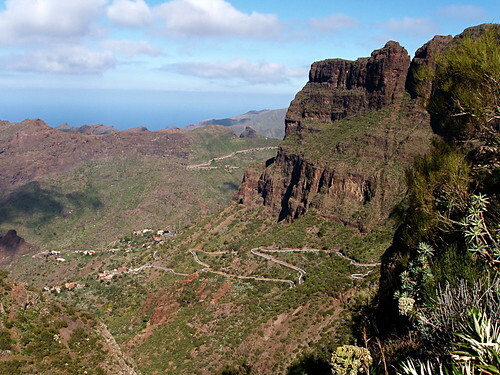 The road to Masca is part of the Hidden Depths drive in Real Tenerife Island Drives.